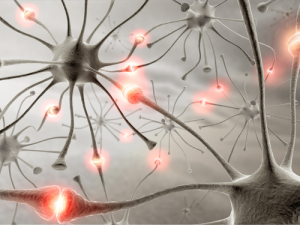 Entrapment neuropathy is caused by the prolonged compression or irritation of a nerve plexus or peripheral nerve. The final result is nerve dysfunction and chronic neuropathic pain in the innervation area of the affected nerve. In certain body positions, nerves tend to be compressed by surrounding tissues -not only under pathological but also under normal conditions. In some cases, there is also compression of blood vessels resulting in symptoms and signs from the reduction of peripheral blood circulation. 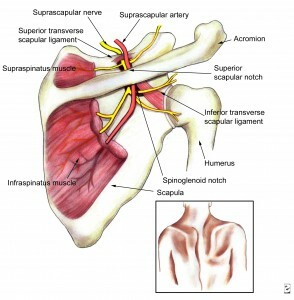 Compression of the suprascapular nerve in the scapular region. This may be caused because of heavy bags hanging from the shoulder for long periods or due to a direct fall injury or a malignant process. 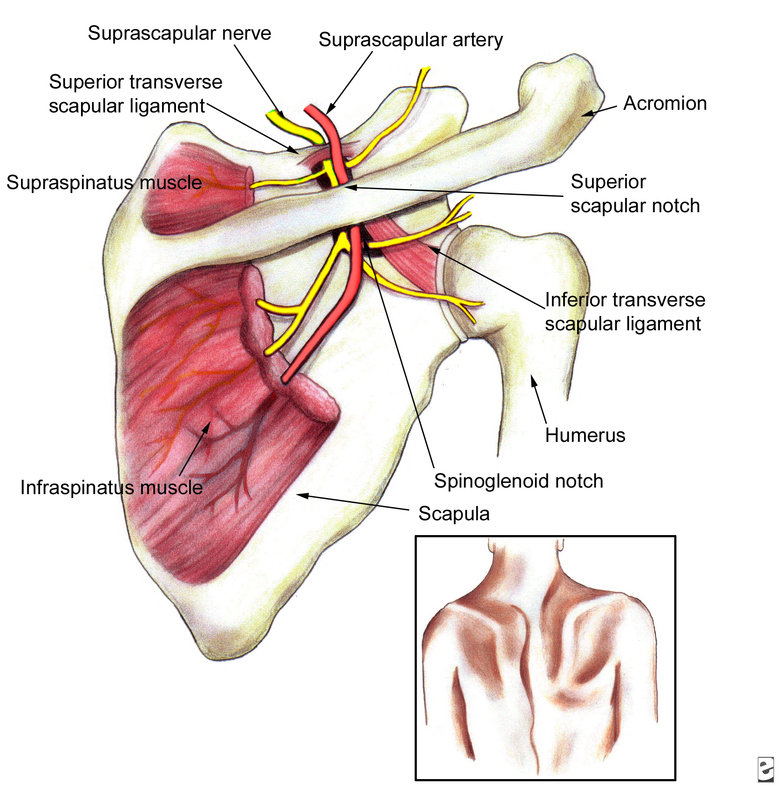 The suprascapular nerve is a branch of the brachial plexus and is formed from the 5th and 6th cervical root. The nerve courses downwards and backwards and passes through the suprascapular foramen under the transverse ligament. It provides sensory innervation to the shoulder and motor innervation to the supraspinatus and infraspinatus muscles. Throughout its course, it is accompanied by the suprascapular artery and vein. The patient feels a deep intense pressure in the scapular region, which may radiate from the top of the scapula to the ipsilateral shoulder. There is tenderness to pressure of the suprascapular foramen. Shoulder movement with elevation of the arm towards the anterior thoracic wall usually causes pain in the scapula. Prolonged pressure of the nerve for a long period of time may cause weakness, even atrophy, of the suprascapular and infrascapular muscles. • Suprascapular nerve diagnostic block with local anaesthetic provides immediate pain relief for as long as the local anaesthetic action lasts. The transverse carpal ligament is the roof of the carpal tunnel, through which pass the median nerve and finger tendon flexors. The median nerve provides sensory innervation to the thumb, forefinger, middle finger and half of the ring finger, as well as motor innervation to some hand muscles. If the carpal tunnel space is reduced due to inflammation and oedema, or if there is hypertrophy of the ligament because of its overuse, then the space where the median nerve runs is reduced and the nerve cannot function normally. 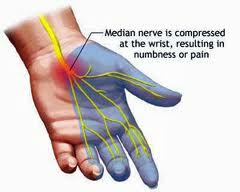 The patient feels pain, numbness and needle sensation in fingers that are innervated by the median nerve. In some patients, the pain radiates to the forearm, upper arm, shoulder and neck. There is muscle weakness in fingers. Pain may be reproduced with pressure upon the carpal tunnel by the examiner’s thumb for about a minute. • Rest and stretching exercises designed for opening up the carpal tunnel space. Place the two palms opposite one the other and exert pressure in such a way that the wrists form a 90o angle with the forearms. This may instantly aggravate the pain but it also stretches the tunnel and, in the long run, reduces the nerve compression. • Oral anti-inflammatory drugs rarely help. • Injection of corticosteroids within the carpal tunnel has an anti-inflammatory effect and reduces the oedema (ATTENTION: DO NOT inject into the nerve), . 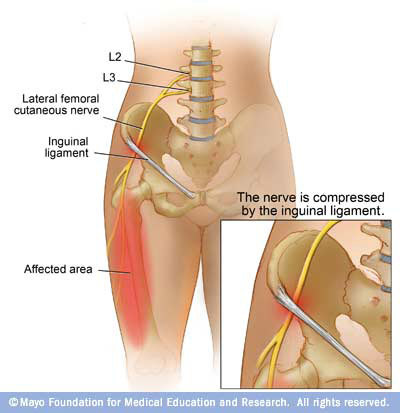 It occurs when the lateral femoral cutaneous nerve is compressed by the inguinal ligament, usually due to obesity, gestation or too tight belts worn around the waist. The lateral femoral cutaneous nerve is a branch of the lumbar plexus and is formed by the branches of the 2nd and 3rd lumbar spinal root. The nerve courses downwards and passes under the inguinal ligament to provide purely sensory innervation to the skin of the anterolateral aspect of the thigh down to the knee. At the point where it passes under the inguinal ligamentthe femoral cutaneous nerve may be compressed by the ligament, particularly in obese individuals in whom the ligament is enlarged. The inguinal ligament extends from the anterior superior iliac spine (spina iliaca) to the pubic process and is hand palpable. The patient complains about pain (occasionally burning), numbness and tingling sensation (pins-and-needles) in the anterolateral aspect of the thigh down to knee. The symptoms may be reproduced when pressure is exerted on the inguinal ligament about 2 cm medially of the anterior superior iliac spine. It is characteristic that symptoms improve when the patient is seated and, on the contrary, they become worse when lying on the back and extending the hip joint. From a biomechanical point of view, this can be easily explained: when the patient is in supine position with the hip joint in extension, there is an increase of the pressure exerted on the nerve since it comes closer to the inguinal ligament. On the contrary, when the patient is seated, the nerve moves far from the ligament. The disorder often causes unbearable pain and is easily confused with trochanteritis or radiculitis due to a herniated intervertebral disc which may co-exist, as may be shown in an MRI. However, the real cause is a morphological abnormality and not typical sciatica due to nerve root inflammation. The differential diagnosis is made by taking a good history, for it is obvious that sciatica due to disc herniation is neither relieved with the patient in sitting position nor aggravated with the patient lying down. Moreover, the low back radicular pain rarely terminates at the knee level. In addition, trochanteritis causes pain locally in the greater trochanter area and not superficially to the skin of the anterolateral thigh down to knee, which is the region innervated by the lateral femoral cutaneous nerve. Block of the lateral femoral cutaneous nerve with local anaesthetic offers immediate pain relief during the period that the local anaesthetic is acting. In this way, the diagnosis is made for meralgia paraesthetica. EMG specifying the level of the lesion and nerve dysfunction, which in the case of meralgia paraesthetica is found to be more distally. Block of the lateral femoral cutaneous nerve with local anaesthetic and corticosteroids. If necessary, the block can be repeated several times, after limiting only cortisone. 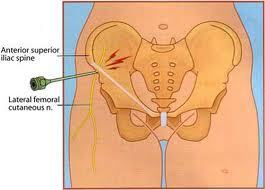 Pulsed Radiofrequency οn the lateral femoral cutaneous nerve. This technique acts in a neuromodulatory way. The nerve ablation (neurolysis) with classical radiofrequency or alchohol is avoided due to the risk of provoking anaesthesia dolorosa (strong neuropathic pain in an already anaesthetized area).